How Are Marital Assets and Liabilities Divided in a Divorce? A divorce is a major life event, because it’s incredibly complicated. In addition to dealing with emotional turmoil and the upheaval of your current family, you’ll have to worry about sorting through your assets and liabilities. The prevailing goal of a divorce is to distribute those assets and debts in a fair and equitable manner, although that doesn’t necessarily mean each partner gets an equal share. 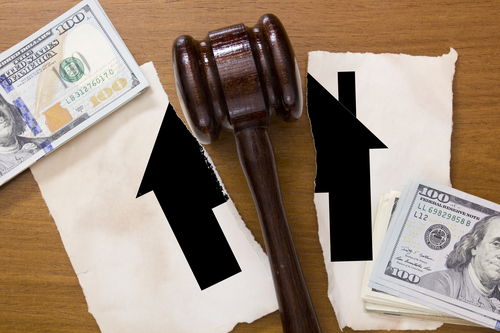 Here you’ll learn more about marital and non-marital property and the rules that govern your divorce. Generally, everything that was accumulated during the marriage is considered marital property. Even certain non-marital assets will be considered marital property if they are comingled or sold during the marriage. For example, one partner may have owned a home in their own right before their marriage, which could be considered non-marital property. However, if the couple turns the home into a rental or applies for a home equity loan with that property in the course of the marriage, part or the entire value of the house may now be considered marital property. What Are Examples of Non-Marital Property? Anything a spouse owned before the marriage can be considered non-marital property as long as that asset hasn’t been commingled into a joint asset. For example, if one of the spouses owned valuable jewelry before the marriage, those diamonds may be considered non-marital property. However, if they sold the jewelry and used the money to purchase a beach house, the beach house would probably become marital property. To prevent the mingling of assets, a prenuptial agreement is necessary. If one of the spouses receives an inheritance during the marriage, that inheritance is generally considered non-marital property. As such, it can’t be divided among the partners. However, an inheritance is often used to purchase something else, unless it’s in a form that’s not easily liquidated. If you’re not sure whether you’re dealing with non-marital property, it’s best to ask your lawyer for specific advice to your unique situation. The division of assets and debts during a divorce must be fair to both partners, but it doesn’t have to be equal. For example, one partner may have the newer car with the bigger car loan, because they’re able to afford the monthly payments. Similarly, if it’s financially feasible, one of the spouses may keep the family home for them and their dependent children even though the other spouse doesn’t have a comparable asset. The goal of a divorce is to allow each partner a fresh start after dividing assets and debts in a fair and reasonable manner. When it’s time to divide the assets, the court will consider the length of marriage and how much the partners have invested in the assets and each other. However, that doesn’t mean a spouse that stayed at home has any less right to the marital assets than the spouse that provided full-time income to support the family. What Happens to Your Assets and Debts? While it’s good to know that assets are divided using specific criteria, you’ll probably want to know how this will play out in your case. For specific answers, it’s a good idea to speak to your attorney. However, you should know that you are not expected to bear the burden of your debts alone after a divorce as both partners are equally responsible for marital debt. To finalize the divorce, your assets and debts must be fairly distributed between you and your partner. You will not be able to change these terms of your divorce, although alimony and child support payments may be revisited if the financial situation of either spouse changes. Getting divorced is complicated enough when you factor in the emotional turmoil. The Harr Law Firm strongly advises you to seek legal counsel to make sure that you receive fair treatment during your divorce. We can help you reach a satisfactory solution to the division of your assets and debts. Give us a call or use our online contact form to ask us your most pressing questions today!